A friend of ours, a brave, faithful, and well educated businessman from Ukraine, has asked his friends here in Shanghai to pray for Ukraine. He and his family have wept over the news coming from his homeland, including the senseless shooting of many citizens who committed no crime but simply showed up to voice their protest over the corruption of their government. When I spoke with him, he was particularly moved by the account of a farmer who came into town to speak out and was shot by one of the dictator's gunmen. Those whose rule is based on force and corruption are made nervous by the events in Ukraine, where a great many people are no longer willing to endure corruption and criminality among their top leaders. May they succeed in improving their lot and casting out corrupt politicians who rob, oppress, and kill to grab power and wealth. I pray that Ukraine may swiftly shake off the corruption that has worn it down so long, and that it may rise with less oppression and a greater degree of liberty for the people. Parliament has taken some bold steps in the past few hours, but so much hangs in the balance. May good come out of this and may the bloodshed cease. Why Wait for the Fruit of the Tree of Life When You Can Eat the Biscuit of Omnipotence Now? Adam and Eve had their temptation in the form of the fruit of knowledge. Mine came in the form of the Biscuit of Omnipotence. And it tastes even better than it looks! Adam and Eve were just after a little knowledge, not even the full omniscience deal. My temptation is much better. Omnipotence is cool because it includes omniscience--or does it? I forget. 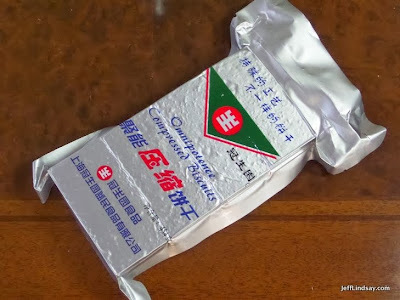 But I think this awesome Chinese product, purchased in the Emart store next to our apartment, is working already. I'm definitely feeling more powerful now. Not sure how many more I'll need to eat to get the full effect, but it's great knowing there's such a handy shortcut. Some Christians spend their lives in a quest for the divine fruit from the tree of life to be given to them after this life is over. 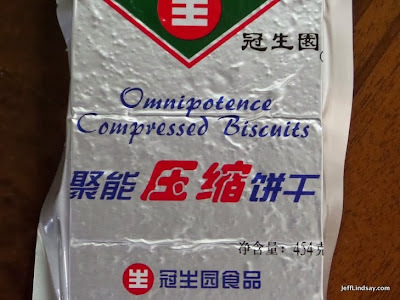 Why wait for that when you can eat the Compressed Biscuit of Omnipotence now? It has to be compressed, of course, because all that infinite power has to be packed into a finite volume. I'll let you know how things turn out after a few more servings. 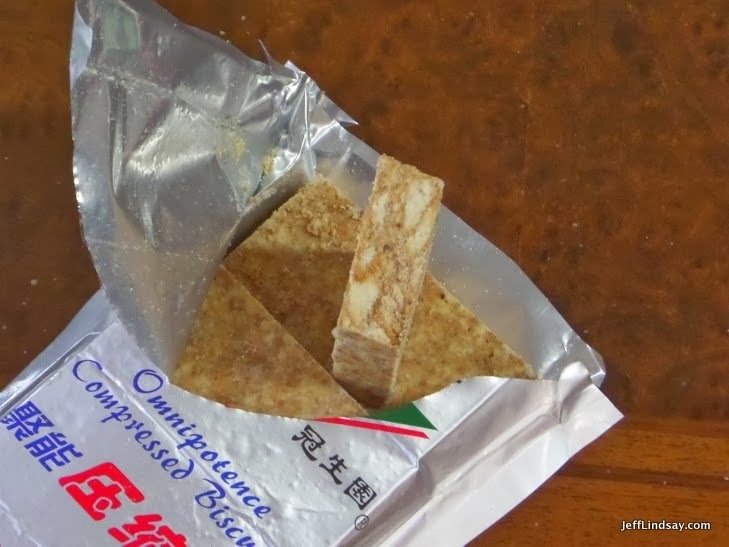 The product, by the way, tastes like a dense, compressed mix of saltine crackers and graham crackers. Crumbly, but not bad. Not exactly how I expected omnipotence to taste--just another of the many surprises that China offers. This week I had to dig into some information about a company in northern Switzerland, including looking up its location on a map. As I did so, I couldn’t help but reminisce over my mission in the now-closed Switzerland-Zurich Mission. That mission has been closed (I think combined with an adjacent mission) because of visa barriers--see the Dec. 2010 story in the Deseret News. It wasn’t an especially easy place for missionary work when I was there, and I guess it’s even harder now. Sure hope the government there will back off and let missionaries return. As I looked at the map of Switzerland and zoomed into an area where I once lived, I wondered how I was able to stand my missionary service. It was wonderful, yes, and one of the best experiences of my life, but some aspects were so contrary to my current tastes that I wonder how I stayed so happy. Food was one of the issues. Cooking on our own, we really ate poorly too often, and my first companion preferred that we skip dinner just about every day so we could work more effectively. We were quite effective, but often a little too hungry, at least for my tastes now. Switzerland has some of the best food in the world, but we skipped too many meals and made too many bad ones. Thank goodness that I didn’t have my current tastes in food. Other companionships left more flexibility for dinner, but my first companion was terrific and probably the ideal one for me, in spite of some of the painful adjustments I would suffer. I also love to explore, to just get out and see as much as I can in new places. Switzerland has so much to see, and I saw so little. We did do some jaunts on a few preparation days, but I wish we had seen a little more. And I wish I had had a working camera. So many memories lost. Today, I’m a total photo fanatic and take hundreds of photos when I travel. Wish I had a few more from my mission. Another surprise was how much everything cost over there. The financial info I received from the Church with my mission call was a quite out of date, and I didn’t quite realize I would be going to one of the most expensive missions in the world at the time. The amount of money it said to bring was too low, in my opinion, and I would run out of money on my first day after having to purchase a bike that would haunt me for much of my mission because it was way too small for my long, long legs. If I were transported back in time to serve in that mission several decades ago, without a good camera, without dinner every day, with inadequate money, with a bike that was too small for me, and with little opportunity to see the wonders of the land, I worry that I would go crazy or AWOL. Fortunately, I was only 19, not yet set in my ways, and was genuinely focused on what a mission really is about: serving others. That focus led to riches far beyond food, photographs, and tourist attractions. It led to relationships of joy that changed my life and my appreciation of the Gospel. It led to miracles, growth, and learning beyond anything I would have experienced just touring and eating my fill. It was difficult but so worth it. I’m so grateful I went and went when I was young enough to endure it and actually love it. I loved it enough that when given a chance to extend my mission by a month, I jumped at the opportunity, and had one of the best months of my life rich in new miracles and blessings. Switzerland was where I met Sophie, whose conversion made all the pain and difficulty of my sacrifice in Switzerland completely worth it. I got to see her in the temple toward the end of my mission with her new LDS husband. A wonderful experience. It’s also where we met a woman whose conversion and subsequent temple marriage would also bring lasting meaning to the final weeks of my mission. We were blessed to see a number of interesting, good people accept the blessings of the Gospel, and we could see what the Gospel did for them. This strengthened my appreciation of just how good the Gospel of Jesus Christ really is. One of my most important experiences in Switzerland was having a new missionary companion unleash his anger at me and explain what a jerk I was in my own slave-driving approach as his senior companion. That was one of many difficult experiences, but one that helped me soften a few things in my approach and learn to relate a little better with people who are completely different, as we were in many ways. That experience, though, I treasure as a step on the path to preparing for marriage, where being a companion with someone completely different is one of the great challenges and joys of life. Tough missions make for easier marriages, I think. In spite of a lot of bad food we cooked and potentially good food we missed, the Swiss people and many Italians and other immigrants blessed us with many great meals. Both members and non-members treated us with much kindness, and I especially mean kindness in the sense of food. To this day I still value the frequent and often weekly sacrifice of several noble women in various parts of my mission who found meaning in feeding us (sometimes too much meaning as they fed and fed us almost to bursting). One Italian sister would spend hours before we came over for lunch to prepare her killer lasagna. Her name is often in my mind to this day, as are the names and faces of several others who gave us so much with their cooking skills. Those experiences have made me more inclined to try to be hospitable to others and share the gift of food. And they make me especially grateful that my wife loves to do that for others. I’m not sure how I got through some aspects of my mission, but I was intent on sticking with it and count it as one of the things in my life that turned out better than I expected, and one of the many things that turned out better than I deserved. Switzerland, I miss you and hope to be back again some day. Thanks for what you did for me when I was there, and please consider letting some other LDS youngsters into your land to have similar experiences in trying to help those who need their message. "A New Church History Seminary Manual" by Steven Densley at the FAIRMormon Blog discusses the new seminary manual just released by the Church. This sounds like a real breakthrough that will help young people better understand some of the difficult issues in Church history and be better prepared for the kind of challenges they are going to face on their missions or later in life. This is great news. This comes on the tail of the Church's statement which deals directly and intelligently with complex issues involving DNA and the Book of Mormon, providing valuable resources for those who care about the topic. I can't help but wonder what interesting steps we'll see next from a Church that clearly cares about some of the intellectual challenges its members have faced. Maybe a new priesthood and Relief Society manual extracted from The Mormon Interpreter? Now that would be fun.